A triple conjunction of Jupiter and Saturn in a given year was very rare indeed. This conjunction in which the two planets seemed to almost touch one another occurred on May 29th, October 3rd and finally on December 5th in the year 7 B.C. The three Buddhist (*) wise men observing this astronomical miracle were convinced. A reincarnation had indeed arrived on Earth and it was finally time to meet him. They would then need to convince themselves that he was indeed the one that they were looking for ... They needed to visit Jerusalem.
. 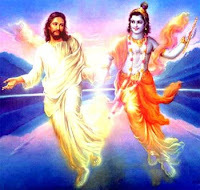 Both were called Savior, and the second person of the Trinity.
. Krishna and Jesus were of royal descent.
. Both were visited at birth by wise men and guided by star.
. Both Yeshua and Krishna withdrew to the wilderness as adults, and fasted.
. Christ was called "the lion of the tribe of Judah." Krishna was called "the lion of the tribe of Saki."
. Both claimed: "I am the Resurrection."
. Both referred to themselves having existed before their birth on earth.
. Both performed many miracles, including the healing of disease. One of the first miracles that both performed "to make a leper whole". Each cured "all manner of diseases."
. Both cast out indwelling demons, and raised the dead.
. Both were meek, and merciful.
. Both were criticized for associating with sinners.
. 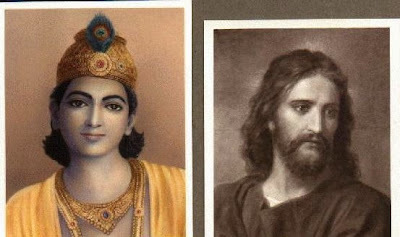 Both had a woman (Radha, Mary Magdalene) who played significant influence on their respective lives. Interestingly in Hindu tradition Radha is celebrated as a partner of Krishna whereas the Christian Church suppressed the status of Mary Magdalene who's traces can more openly be found only in the Gnostic Gospels.